Martha Stackhouse (left) with fellow educators in Barrow. SARAH GONZALES: It’s a Friday at the University of Alaska Southeast in Juneau. Ten students are wrapping up today’s class, getting ready to start the weekend. Half are undergraduates and half are graduate-level students … all of them are Alaska Native. They come from Metlaketla, Craig, Hoonah, Juneau and Anchorage and they are each receiving a scholarship from the School of Education. SG: Cadiente-Browne says that the program has graduated 64 students of Alaska Native heritage since it began. 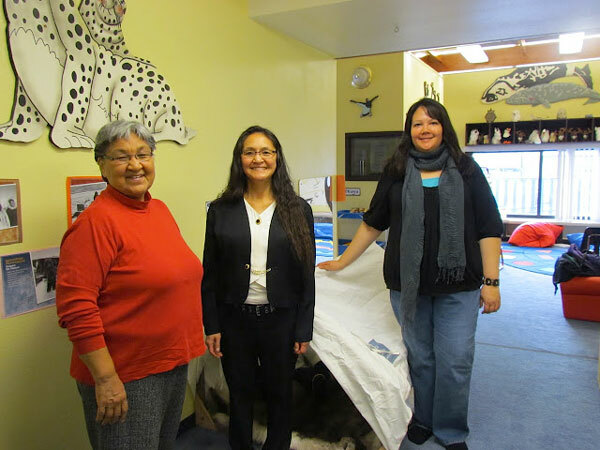 Nemasia Moala is from Juneau and plans to teach Tlingit and English in Juneau after she graduates. SG: Stackhouse says when she began teaching in Barrow in the 1980’s, it was hard for the Inupiaq community to accept that she could do a good job as an Alaska Native teacher. Acceptance of Native teachers may have come a long way since then; now the challenge is to find more of them. This reporting series is a production of the Content Producers Guild and is made possible through funding from the Association of Alaska School Boards’ Initiative for Community Engagement program. For more photos and information please visit KidsTheseDays.org.